Guacamole is a staple around here. 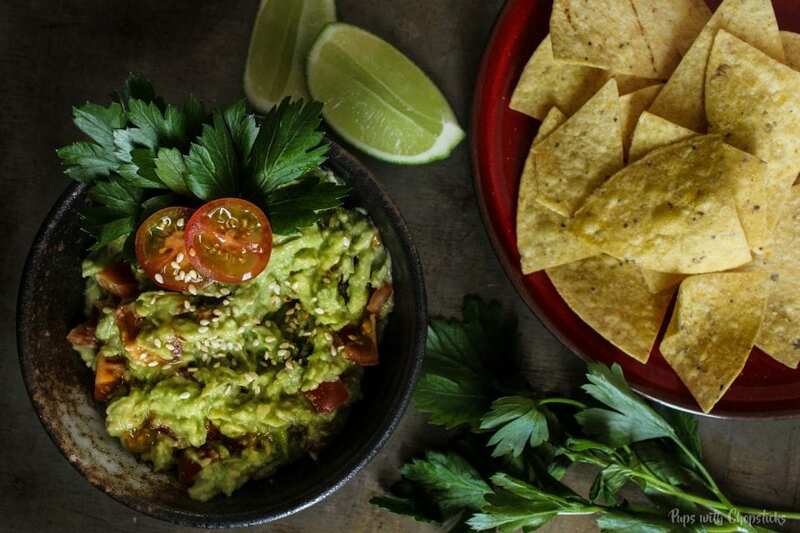 Then again so are fries and nachos and with my dippy dip dip tendency it’s no wonder we always have this around – so it’s no surprise when we decided to switch up the usual traditional guacamole with some new flavours. 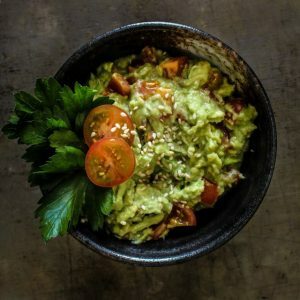 This particular guacamole recipe is quick to make, easy and healthy and you can practically dip anything in it and it would taste fantastic. 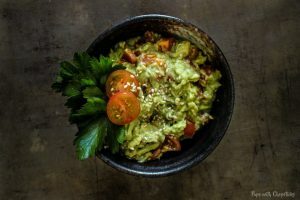 Since we are on the topic of guacamole and experimenting I thought I would also share with you my quick and dirty guacamole recipe that literally takes 2 minutes (if that!). The secret? Pre-made salsa! Weird eh? 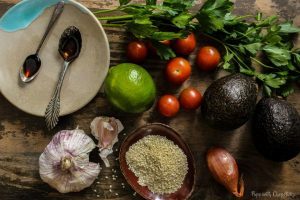 Take a few avocados, mash up some garlic and scoop in a few tablespoons of salsa, add in lime juice, some salt to taste and mix. Voila! The salsa replaces the onions and the tomatoes! For this guacamole recipe, all ingredients can be found at your local grocery store. To achieve the nuttiness in this dip, we toast the sesame seeds. You can buy sesame seeds pre-toasted, but if you don’t mind the extra few minutes of work it’s well worth the effort to toast your own. We used baby tomatoes for this recipe, because we find that they are much sweeter and give the recipe a bit of a flavour pop. How Do We Pick Out Avocados? When you are picking out avocados, go for the black skinned ones. Give the black avocado a gentle squeeze, they should feel like a ripe banana – firm with a little give. If they are really squishy to squeeze then move on to another one. The green ones look much prettier but they are still raw and cannot be used – they actually are bitter when they are raw and almost impossible to peel. If you only have green ones at the store, no worries! 🙂 You can leave them out at home for a few days and they will ripen and turn black. One mistake I made in the past was putting my raw avocados in the fridge. They won’t ripen in the fridge, sometimes you may notice they will turn black in the fridge but if you actually try to cut it open and use it you will notice the flesh is tough. Toast your sesame seeds on low heat. Make sure to keep the pan moving so they don’t burn and never take your eyes off of it – these little guys burn fast! This will take about 3-5 minutes, you will know it’s done when it’s golden brown. Cut the avocado in half and remove the pit. Scoop the avocado out of its skin then mash in the mortar and pestle to the consistency you like. (Some like their guacamole smooth, some like it chunky! Mash it to your preference.) If you are using a bowl and going the chopping route you can mash up an avocado with a fork but one neat thing I learned in Mexico was to use the bottom of a cup to mash it in the bowl! Finely chop up the tomatoes, and gently mix it into the guacamole. Why not just mash it in? The bites of fresh tomatoes give this a nice texture and flavour pop! When you mash the tomatoes in, we find you can’t really taste it. Cut the avocado in half and remove the pit. 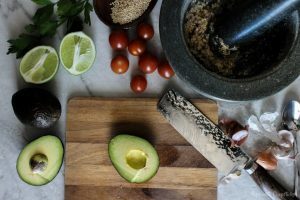 Scoop the avocado out of its skin, then mash it in the mortar and pestle to the consistency you like. (Some like their guacamole smooth, some like it chunky! Mash it to your preference.) If you are using a bowl and going the chopping route you can mash up an avocado with a fork but one neat thing I learned in Mexico was to use the bottom of a cup to mash it in the bowl! Enjoy with veggies, chips, in sandwiches or on tacos! Thanks for those tips on picking avocados and how not to store them. Lovely recipe too. Sounds awesome! And your photos are just stunning. 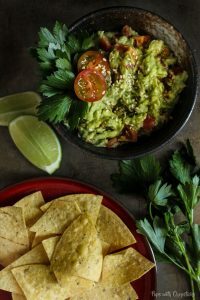 Guacamole is one of my favorites and this looks fantastic! Love the addition of the sesame and soy! You can never go wrong with a good bowl of guac! And love your flavor additions to spruce it up! That looks like an incredible guac recipe! I love all of the step by step directions. I can never get enough guacamole, and yours is so pretty! Great tips on how to pick a good avocado. Yum! I’ve never put sesame seeds in my guacamole before, but it sounds great! Nice additions to the basic recipe. I’ve not made my own guacamole for ages. Oh, guacamole is a constant in our home, as well. Like you, I like to sprinkle mine with sesame seeds, but the black variety. Absolutely nothing wrong with buttery and nutty! What a creative idea! I love sesame seeds and I bet this guacamole doesn’t disappoint. Thank you for sharing. I cannot wait to try this! Luci’s Morsels | fashion. food. frivolity. It’s the buttery and nutty! Such a awesome combo. Basically, you had me at toasted sesame guacamole because YUM… and it’s quick, easy, healthy and flavourful too?! I am definitely saving this recipe to try out! I also like your guacamole cheat too. It’s so simple! Thanks Joyce! I make the cheat guac a lot. Literally takes 5 minutes and you have a garlicky butter dip! i can’t see how this could be bad! soy and sesame go with everything, and more umami + nuttiness in guac is veryyyy welcome in my book. i don’t play around with guac much, but sometimes i like to add nectarines or stone fruit, and make it into a summer salsa for fish! buttery and nutty! double win! 😀 I just recently found a love for fruit in salsa and holy moly amazing!